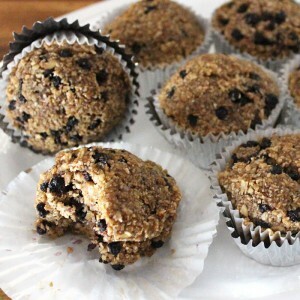 These blueberry banana muffins are raw vegan and gluten free with on point taste and texture. This is closest I could get to a real muffin while keeping it as healthy as possible! If my picky family and friends enjoyed, I have a feeling you will too! I just had an amazing Mini Vacation/Thanksgiving/Birthday in Upstate NY with my family. We had such a good time catching up, and preparing delicious food, time just flew by. It felt way too short, you know when you are anticipating a trip and it takes forever to get here and when it finally comes it’s over in a blink of an eye, well that happened. Good thing we made the most of it staying up well into the night and waking up somewhat early in the morning. The car ride, however, did not feel short, what would have been a 6.5 hour drive turned into a 12 hour drive with traffic both ways. Luckily before our trip I packed us some good road trip snacks like my favorite protein bars, peppermint cookies (I need to share this recipe too!! ), and these amazing blueberry muffins! We managed not to eat all of the muffins on our road trip and were able to share them with my family…they loved them!! So does everyone else who has tried them so I knew I needed to share this simple delicious recipe so you could love them too! I mean how could you not, they are soft yet dense, rich in blueberry banana flavor, and completely raw vegan which means they were super easy to make and as healthy and pure as possible. This recipe made about 6 large muffins, I think next time I’ll make minis for an easy little snack because these really do fill you up quick and they’ll take less time to dehydrate. I also double my batch because I know they will go fast between Dominick, myself and sharing with as many people possible, they normally don’t last more than a week. And for this reason I’m not sure of the shelf life, but I’d say if they were dehydrated well enough they could last 2-3 weeks. I always like to follow with saying the faster you eat raw food the better because the whole point of eating raw food is to get as many nutrients as possible. 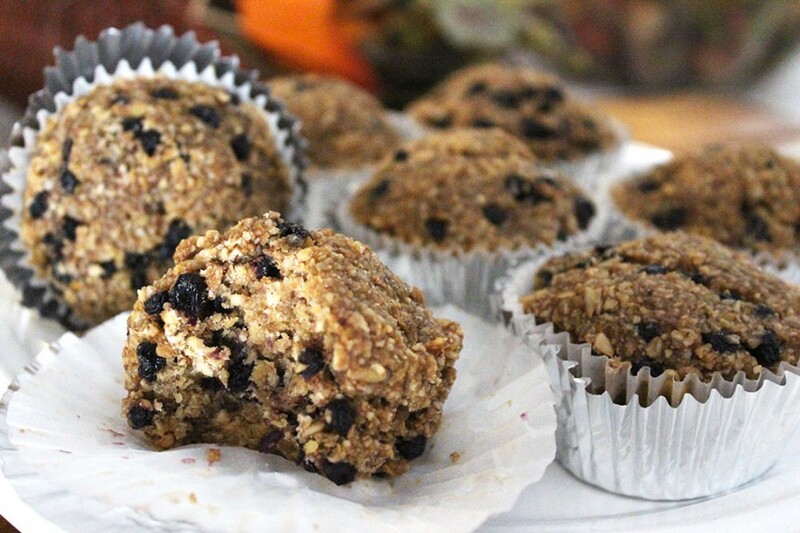 Rich, decadent raw vegan and gluten-free blueberry banana muffins. In a food processor, process rolled oats into a flour. Add in brazil nuts and process again. In a spice grinder, grind flax seed. Add in the rest of the ingredients to the mixing bowl and mix well. Add your mixture to muffin cups in a muffin tray and dehydrate at 165 degrees for 1-2 hours, turn down to 105 degrees for 5-6 hours. *Use the blueberry soak water if your mixture is incredibly dry, it shouldn't be once all mixed together. Store them in plastic storage bags in the refrigerator. 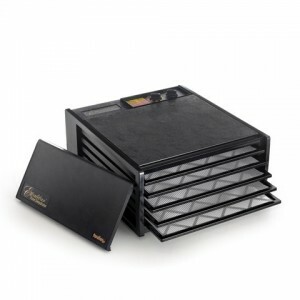 Don't have a dehydrator?Use your oven at the lowest temp possible and keep the door cracked open to allow ventilation. Times vary so keep your eye out. I normally warm them in the oven or dehydrator before eating. But they are good at any temperature really. This sounds great but is not raw. If you go above 118 degrees it is considered to be cooked. I used to believe this as well but then I read an experienced that food will not actually reach 165F in the first hour or two, and it is important to start at a higher temp to reduce the risk of mold and bacteria development. If you don’t feel comfortable with this you can certainly dehydrate at 115F the entire time. If you smell or taste sweet/sour fermentation, then I would worry about bacteria/mold growth.